The god-of-the-gaps argument asserts that it is invalid to introduce God as an explanation for a scientific phenomenon that we cannot currently explain by naturalistic causes. Believers in naturalism take this a step further, and offer the god-of-the-gaps argument against any involvement of God in nature. However, the god-of-the-gaps argument is only good against a particular deistic approach to God and nature, and loses its potency when Scripture and science are pursued together. 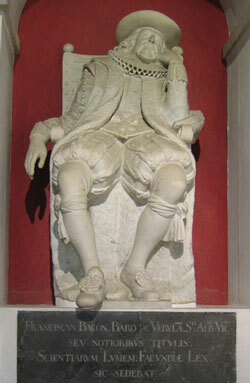 Memorial to Francis Bacon at St. Michael’s Church, St. Albans, England. Bacon was one of the leading exponents of the scientific revolution. His opposition to reliance on ‘authority’ in the scientific enterprise influenced generations of scientists, a factor that should be recognized in analyzing a god-of-the-gaps argument. In approaching the subject, it is helpful to start by distinguishing two similar phrases that have different meanings. First, the ‘god of the gaps’ is the use of the invalid reasoning that inserts God as the explanation for any unknown. Second, the ‘god-of-the-gaps argument’ is the critique of god-of-the-gaps reasoning. What is a ‘god of the gaps’? The classic example is a primitive society in which phenomena as diverse as a rainfall, a sunrise or a cancerous tumour are attributed to the direct acts of a god (or gods) who personally agitates clouds, lifts the sun (and sets it back down) daily, and punishes people by implanting painful growths in them. Of course, we know better. We know that rain is part of the hydrologic cycle of evaporation, condensation and precipitation which is the normal consequence of physical laws. We know that the sun appears to us to rise and set because we are on a rotating spherical planet. We know that tumours are caused by cells dividing uncontrollably due to mutations in DNA. But our tribal populace sees each of these phenomena as the direct activity of its god. Indeed, they would rather not hear any other explanation, for that would seem irreverent, ungrateful to their (generally benevolent) deity. Hearing a scientific explanation would restrict their god’s activity; if this went on too long their god might be essentially eliminated from being an active deity. In this way, god-of-the-gaps thinking inhibits scientific progress. 1. Conceptually allowing God to directly act in nature undercuts the scientific enterprise (you won’t look for how DNA could have formed naturalistically, for instance). This is the ‘scientific’ prong of the argument. 2. Once (1) is granted, it follows that conceptually allowing God to directly act in nature will ultimately reflect badly on God, for at some point science is likely to find a naturalistic explanation for the phenomena at issue (e.g., formation of DNA), and then the God of Christianity will appear as discredited as the tribal deity. This is the ‘theological’ prong of the argument. The god-of-the-gaps argument has been employed extensively in the modern discourse over design and evolution, particularly in response to the Intelligent Design (ID) movement. The god-of-the-gaps critique is … reminiscent of deistic natural theology of the nineteenth century and before, determining God’s activity based on reasoning divorced from Scripture. The scientific prong of the argument is presented with at least two major emphases. In response to the god-of-the-gaps argument, we point out that it is inapplicable to a presuppositionally biblical approach to science—both as to origins and normative scientific methodology. The god-of-the-gaps argument only functions where Scripture is not the final authority. As philosopher Alvin Plantinga pointed out, the god-of-the-gaps argument assumes something about the theists it is wielded against. It assumes that God is invoked as a kind of ‘large scale hypothesis to explain what cannot be explained otherwise, i.e., naturalistically.’8 If science cannot explain it right now, then God is postulated as the cause. If science can explain it now, God was not the cause. If science cannot explain it now and God is invoked, but later science discovers an explanation, the theist apparently has two choices: (a) acknowledge the scientific version and chalk another item off of God’s ‘to-do’ list, thereby making God’s activity contingent upon science’s inability to explain something naturalistically; or (b) refuse to acknowledge the new science, thereby defending divine action to the detriment of science. Both alternatives present the theist as unscientific in differing degrees. Neither is conducive to scientific progress. The point that is important is that any approach to God-and-nature that is susceptible to a god-of-the-gaps critique is one in which the only way to determine divine activity in the world is by the scientific method’s failure. And this is not the biblical perspective. It is, rather, reminiscent of deistic9 natural theology of the nineteenth century and before, determining God’s activity based on reasoning divorced from Scripture. This has gone unrecognized for too long. In contrast to the quasi-deistic approach susceptible to the god-of-the-gaps critique stands a biblical view of the interaction of God and nature. God acts where He said in Scripture that He has acted.10 From this, two points are derived. First, the primary-cause activity of God does not depend on our examining a circumstance for possible naturalistic/scientific explanations, and then inferring God’s activity if no plausible naturalistic explanation turns up. This would be to subject God’s activity to a bizarre kind of contingency analysis, where His activity is contingent on man’s need of God as an explanation or not. Instead, God may have been the cause even when there is a naturalistic explanation. Knowing the facts about God’s action is a matter of exegesis, not scientific determination. This is in stark contrast to the ‘deistic’ approach against which the god-of-the-gaps critique operates: it starts from a basically ignorant position, not knowing what act God has done in the world except where God is the only explanation. Consider two of the miracles of Christ: turning water to wine,11 and multiplying loaves and fish.12 Both of these miracles resulted in the creation or transformation of a substance which was not there before. Yet taking the end products in isolation—wine, fish, loaves of bread—there are certainly naturalistic explanations. Wine does not require supernatural activity; just juice from naturally grown fruit and a natural fermentation process. The presence of fish for food does not require supernatural activity: merely the capture of fish that hatched and developed according to normal, scientifically understood processes. Bread is the result of natural chemical and physiological reactions in the combination and heating of natural ingredients under the proper conditions. Yet biblically, we know that none of these natural explanations would be correct for describing the means whereby the end products came about in the cases of these miracles of Christ. This approach is a natural result of treating Scripture as history in all such cases as it is to be understood that way, under a proper hermeneutical and exegetical approach. We can call this the ‘exegetical’ or ‘historical’ factor. Knowing the facts about God’s action is first of all a matter of exegesis, not scientific determination.13 This is in stark contrast to the ‘deistic’ approach against which the god-of-the-gaps critique operates: it starts from a basically ignorant position, not knowing what act God has done in the world except where God is the only explanation. 1.a) Because of the presumption of regularity in nature, the scientific method is sound, and we do not expect experiments to come out differently because, for instance, God directly did something to the chemicals. 1.b) The impetus for scientific discovery is preserved for the same reason—and indeed furthered—because there is a theological impetus for learning more about the normal means that God uses to uphold creation now. If adopted in Christian discourse over miracles, nature and science, the approach outlined above effectively cripples any god-of-the-gaps critique. Yet this seems too simple; how could the god-of-the-gaps critique have gained such widespread use if it is solely applicable to deistic approaches to nature? The answer is that, unfortunately, a common Christian approach to nature and Scripture itself created the god-of-the-gaps problem. After the event of creation itself, God ‘rested’ and ceased from His creative activity. Now the normative relationship of God to His creation is upholding its consistence. Because Scripture also teaches that the character of God is logical, regular, and orderly, a presumption of orderly natural law is warranted. Bacon was a complex thinker, but for our purposes it matters less what Bacon himself thought29 than how his legacy was appropriated by his followers in what has been termed ‘Baconianism’. Baconianism was the reigning philosophical paradigm through which several generations of scientists looked at the world, and at its most basic, was a commitment to an experimental inductive methodology. It evolved through the contributions of various philosophers and scientists, but as a whole, it is still safe to say that the ‘Baconians’, most of whom were professed Christians, gladly accepted the ‘two books’ approach. Far from seeing this approach as a limitation on the influence of theology, numerous theologians and clergymen welcomed it as offering a philosophical framework in which science and Scripture could cooperate in the advancement of truth. Baconianism was in the paradoxical position of harmonizing science and Scripture by separating them. Baconian natural theology proceeded on the dualistic assumption that science and Scripture were separate and independent sources of knowledge. Oblivious to problems of interpretation, the Baconians assumed both would always agree and find themselves in mutual support. But by their separation of the two, the Baconians left themselves ill equipped to deal with apparent32 conflicts that arose later on. The Baconian scientists who still clung to firmer biblical orthodoxy as well as the two books approach were unable to give a biblical answer, for by their separation of nature and Scripture they were effectively reduced to a deistic approach. The theological, scientific and philosophical results included the god-of-the-gaps dilemma. As well, the rhetorical effect was to give a new advantage to the naturalists. In the case of Darwinism, the Baconian design advocates had to tear down Darwin’s work to keep their traditional views of design. But now their efforts were seen, not as ‘explaining’ nature by invoking God, but invoking God to avoid explaining nature.40 Hence, the evolutionists were able to charge the design advocates with a retreat from science into religious just-so stories to avoid the implications of science’s latest findings. The naturalist critics of religion in general completed the coup by making explicit the epistemological basis of their revolution, the ‘neutrality’ the Baconians had conceded long before.41 Science, they said, finds truth independently of religion.42 Science’s truth is demonstrable, testable and practical in the real world. Science therefore took the epistemological high ground, and it has replaced theology as queen of the disciplines.43 In reality, theology had planted the seeds of this revolution when she resigned her reign over science. Now science, grown bolder and rebellious in its years of independence, had come back and made clear that the inconsistent dualism of Baconianism was to be rejected in favour of the more consistent hegemony of naturalistic science. The neat Baconian harmony between the ‘world’ and ‘Word’ was exposed for the unstable arrangement that it was. It was precisely the refusal to appeal to Scripture as the presuppositional foundation of Christian thought that proved disastrous for the Baconians. Yet Christian interaction with science has persisted in avoiding appeals to Scripture, trying instead to maintain an ostensible neutrality. The Intelligent Design (ID) movement is the latest, and most philosophically sophisticated, attempt to retain God’s involvement in nature but without appealing to Scripture (and actually stopping considerably short of the natural theologians in its refusal to identify the Designer). Theistic evolution has also continued the separation of Scripture and science to a large extent. Fearing the same defeats experienced by the Baconian natural theologians, modern theistic evolutionists profess a commitment to methodological naturalism as applied to science, without any place for the biblical historical-exegetical approach to actual interventions. Both the ID theorists and the theistic evolutionists have offered responses to the god-of-the-gaps problem. By briefly reviewing these, we can see points consistent with and even helpful to the biblical approach we are advocating, as well as important shortcomings insofar as ID and theistic evolution have rejected a biblical approach. Theistic evolution has viewed itself as the preserver of theism in an age of science. Its first principle for understanding God and nature is actually a biblical one. It holds that God’s involvement in His creation is by means of upholding and sustaining in some manner the very existence of the universe. As such, He is intimately involved44 in the universe today despite the fact that we are not observing new plants, animals or galaxies created ex nihilo. We agree with this analysis, and it reflects the biblical position as to God’s normal manner of dealing with creation today. The second principle of theistic evolution is the point of disagreement. It holds that God has never been involved in creation in any way other than the normal way He sustains it today. With this principle, the theistic evolutionist manages to separate the Bible’s historical content from nature. For the real issue is not whether God can be involved in nature via what we call ‘natural law’ or ‘normative dealings’ with creation (as we discussed earlier, such involvement is biblical); the issue is whether God is constrained to only this one way of interacting with His creation. To hold this latter position is to ignore the teaching of Scripture. It is in fact the assertion of naturalism as a higher authority than Scripture. The miniscule minority of professed theistic evolutionists who have been more thorough in eliminating God from all gaps have found themselves with a deity unrecognizable by any tradition in the Judeo-Christian legacy. It is significant that theistic evolutionists have been unable to be absolutely consistent in avoiding any direct action of God in nature. The miniscule minority of professed theistic evolutionists who have been more thorough in eliminating God from all gaps have found themselves with a deity unrecognizable by any tradition in the Judeo-Christian legacy.45 Most professed theistic evolutionists will accommodate the naturalism only so far. Gaps are not eliminated, but merely moved down to a smaller level (such as quantum indeterminacies) or to a more remote moment (before the Planck time). For example, ‘Polkinghorne argues that the principle of quantum indeterminacy allows for brief, tiny breaks in chains of causal events, gaps that give just enough room for God to act, to put his finger, so to speak, into the universal mechanism at just the right places to direct events.’46 Likewise, Francis Collins is willing to view the big bang as some sort of direct divine action.47 Yet because theistic evolutionists have rejected a biblical-exegetical approach to interventions of God in nature, they retain these various odd remnants of ‘primary cause’ activity only in a deistic, ‘it can’t be explained any other way’ manner. In other words, these minimal acknowledgments of God’s power and ability to intervene in nature in a direct manner are only kept by the very method of reasoning which led to the god-of-the-gaps problem in the first place. Theistic evolution does a service of emphasizing the fact that God’s sustenance of creation, His normal way of maintaining it today, places Him in direct involvement with the universe even now. But in its extrapolation of today’s order into the past, theistic evolution is reduced to either bad theology or bad science. It is bad theology because it rejects significant exegetical considerations and leaves the intervention of God to be discovered on deistic terms. It is bad science because this actually does raise a god-of-the-gaps problem. On two occasions (Mat. 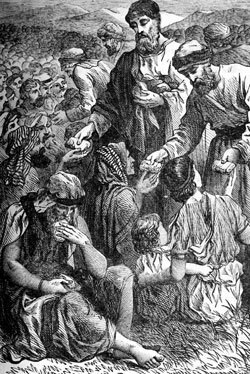 14:13–21, 15:32–39), Christ miraculously multiplied loaves and fishes to feed a multitude. Bread and fish are normally assumed to have naturalistic ‘secondary-cause’ explanations, but such an interpretation on these occasions would have been factually erroneous. But the only reason we know that supernatural explanations are exceptional is because we are operating on a fairly extensive base of scientific knowledge already (we know how the sun rises, how embryos develop, etc.). But if ID had been the norm for the last millennium, how would science have proceeded? On ID’s grounds alone, would we have gotten science to where it is today—would there be motivation for science? If we operated on ID alone, a thousand years ago, why would we have assumed that there could be a natural (as opposed to a mysterious, inexplicable supernatural) primary cause for, say, bubonic plague? Behind the common-sense analysis lies the question of why we are justified in assuming an underlying consistency in nature, including assuming that God would not be randomly creating new creatures or plagues or tinkering with our DNA. ID cannot answer this question because it lacks any theology of its designer. Its designer is unidentified and unknowable, so we have no reason to assume anything about him/her/it in advance. The problem is solved in the biblical framework by the consistent and regular nature of God, which justifies the presumption of regularity in nature and hence the effectiveness of science. In sum, ID’s first response to god-of-the-gaps is okay as far as it goes, but it does not go very far. Second, ID advocates have responded to the god-of-the-gaps argument by arguing that ID is based on positive scientific evidence for design.50 It is not based on showing that evolution cannot work, and then inferring an ‘intelligent designer’ as the cause.51 This is a much more useful argument, equally relevant to ID and biblical creationist approaches to the evidence. However, if not used carefully, it is easy to poke holes in this approach. Much of the ID literature is in fact devoted to showing the insufficiency of Darwinism. This negative strategy should be acknowledged and distinguished from the positive arguments for design. For instance, Dembski’s ‘explanatory filter’52 consists of both negative and positive parts: (a) event X is too improbable for law or chance (thus evolution is out for biological specified complexity); (b) probability is compatible with design; ergo, design. The same positive and negative arguments are also easily identified in Behe’s presentation of irreducible complexity.53 Negatively, evolution could not have formed the irreducibly complex object. Positively, irreducibly complex features are regularly, in our observation and experience, formed by design. Thus, inference to the best explanation leads naturally to identification of a designer as the best explanation for a biological system. The distinctions are important. The standard negative arguments are generally directed at a particular naturalistic scenario, namely, orthodox neo-Darwinism. However, just because a particular naturalistic scenario A could not have formed biological structure x, it does not follow that a designer did it. To make such an argument would require knowledge that A is the only naturalistic way to form X. And this is virtually impossible to prove (there is no way to prove that we have thought of all the naturalistic options). (Hence the criticisms of Behe as being ‘uncreative’ when he dismisses a traditional evolutionary explanation and does not try to think of another naturalistic explanation before announcing ‘design.’51) So a negative argument almost always raises the risk of a god-of-the-gaps situation. Further, a designer may be the best explanation for event X, and this too is a positive argument. For instance, we may know that in our experience, human designers designed all the rotary motors we have encountered, in a variety of engines. We may infer that it is similarly likely that a designer made the rotary motors that we find in nature as the bacterial flagellum and ATP synthase—an inference to the best explanation. It may be easy to eliminate naturalistic explanations, but then inferring a designer is technically a separate inference. This does not mean that the negative argument is irrelevant. Eliminating conventional naturalism as a possible explanation is still important to open up consideration of the better explanation of design. The main point is that to move directly from the negative argument, to an inference of a designer, raises the god-of-the-gaps problem, but just a little more care in formulating the argument would avoid it. This needs to be more clearly explicated in ID’s responses to the god-of-the-gaps critique. ID has stressed the positive inference to design as the most important point of the theory, but has not yet succeeded in explaining to the public the difference between inferring design as a legitimate explanation on the one hand, and on the other hand debunking the opposition (naturalism/Darwinism). The god-of-the-gaps argument is a serious challenge to the consistency of Christians who claim to accept both Scripture and science. To maintain the acceptance of both, conventional wisdom dictates that Scripture be separated from science. As I have attempted to show, it is precisely this separation that created the inconsistencies of theistic religion-and-science discourse. Into the void left by the absence of biblical history was inserted the deistic god-of-the-gaps. The more consistent devotees of naturalism were right to point out the problems of inserting God as an explanation for what we do not know. To them, the god-of-the-gaps became the discrediting of any involvement of God in nature. But this was extrapolating the argument too far. For the biblical approach, grounded explicitly and unashamedly in the exegesis of the Bible as real history, was never dealt with. See, for example, O’Collins, G. and Farrugia, E.G., A Concise Dictionary of Theology, Paulist Press, New York, p. 97, 2000. Return to text. Polkinghorne, J., The Faith of a Physicist, Princeton University Press, Princeton, NJ, p. 197, 1994. Return to text. Pennock, R.T., Tower of Babel, MIT Press, Cambridge, MA, pp. 164–165, 1999; see review by Steel, A., The tower with many flaws, J. Creation 14(2):41–46, 2000. Return to text. Pennock, R.T., Naturalism, evidence, and creationism: the case of Phillip Johnson, in Pennock, R.T., ed., Intelligent Design Creationism and Its Critics, MIT Press, Cambridge, MA, pp. 88–89, 2001. Originally published in Biology and Philosophy 11(4):543–549, 1996. Return to text. Pennock, ref. 4, p. 89–90. Return to text. Skidelsky, E., The God-of-the-gaps, New Statesman, p. 49, 10 March 2003. Return to text. See generally Ruse, M., Can a Darwinian Be a Christian? Cambridge University Press, Cambridge, MA, 2001. Return to text. Plantinga, A., Methodological naturalism? Perspectives on Science and Christian Faith 49(3):148–149, 1997. Return to text. The general definition of deism is a belief in a creator God who does not intervene after initially creating the universe and setting it in motion. See Emerson, R.L., Deism; in: Wiener, P.P. (Ed. ), The Dictionary of the History of Ideas, Charles Scribner’s Sons, New York, 1:646, 1973. However, dealing with the historical heyday of the deists (complete with their unique beliefs about god, nature and pre-Darwinian naturalism) is beyond the scope of this study (and largely irrelevant anyway). Return to text. I am here building on the foundation of Alvin Plantinga’s approach in his article, ‘Methodological naturalism?’ ref. 8. Plantinga rightly noted that if Christians indeed have truth, it only makes sense to start with what we know to be true. I am presenting and elaborating this Augustinian position with an emphasis on theological terminology and methodology. Return to text. John 2:3–11. Return to text. This was done on two occasions (as Christ Himself makes clear in Mark 8:19–20). The first is recorded in Matthew 14:16–21, Mark 6:35–44, Luke 9:12–17, John 6:5–13; the second, in Matthew 15:30–38, Mark 8:1–9. Return to text. It should be emphasized, though, that we expect the science to fit with the exegetical determination—indeed, that it would be the only scientific explanation that would actually work. Yet we start with the exegetical approach, because Scripture represents our ultimate commitment. And Scripture provides the positive thesis that we expect science to support, in contradistinction to the negative ‘nature couldn’t do, therefore, God did it’ argument that is susceptible to a god-of-the-gaps criticism. Return to text. Although to be precise, it would be true that given enough information about the circumstances, we would know that a naturalistic explanation would not work for any genuine miracle. For instance, if we knew that the liquid in a jar was actually pure H2 O one minute and wine the next, we could rule out any natural fermentation process of juice. This might be viewed as a definitional property of a miracle. So, operating from a biblical exegetical-historical position will naturally give rise to the suspicion that no naturalistic cause could account for the event in question. Yet at the same time, it is always a matter of how many facts we have to operate with. When facts are limited, we may not be able to make pronouncements about the sufficiency of naturalistic explanations. The main point is that with the exegetical-historical approach, the availability of some amount of naturalistic explanation cannot in principle disprove that the event was a direct, primary-cause act of God in nature. The god-of-the-gaps argument is impotent against such a biblical approach. Return to text. 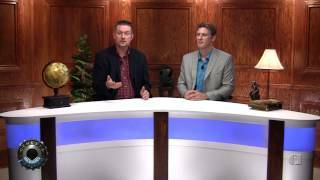 See Ham, K., Wieland, C. and Mortenson, T., Are (biblical) creationists ‘cornered’? Journal of Creation 17(3):43–50, 2003. See also Sarfati, J., Refuting Compromise, Master Books, Green Forest, AR, chapter 1, 2004. Return to text. I am using the term here to denote an event that is not the effect of a natural cause, but of a supernatural cause. This is better described as an event unaccounted for by natural law, rather than a violation of natural law. Return to text. Genesis 2:1–3. See also Hebrews 4:3–4, and Morris, H.M., The Genesis Record, Baker Books, Grand Rapids, MI, pp. 80–81, 1976. Return to text. Hebrews 1:3 (‘upholding all things by the word of his power’). Return to text. Colossians 1:17 (‘by [Christ] all things consist’). Return to text. See Sarfati, J., Loving God with all your mind: logic and creation, Journal of Creation 12(2):142–151, 1998; <creation.com/logic>. 1 Corinthians 14:33, 40. Return to text. Natural law is used in so many ways and in so many different arguments that it has become heavily weighed down with baggage, so care must be taken in using the term. For example, when naturalists suggest that intelligent design violates natural law, they create a false dichotomy between agents and natural law. As Stephen Meyer has noted, ‘Agents can change initial and boundary conditions yet in so doing they do not violate laws.’ Meyer, S.C., ‘Laws, Causes, and Facts,’ in Buell, J. and Hearn, V. (Eds. 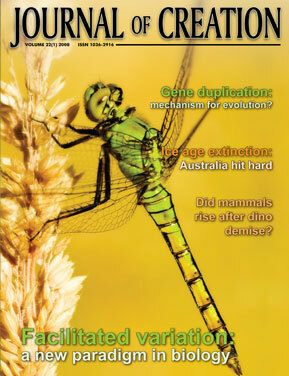 ), Darwinism: Science or Philosophy? Foundation for Thought and Ethics, Richardson, TX, pp. 31–32, 1994. Yet from a theological perspective, natural laws are grounded in God’s own activity—so now we have the ‘agent’ creating the laws. Now he certainly cannot violate his own laws, can he? This line of reasoning (following Spinoza) improperly absolutizes natural laws and creates a false dichotomy between God’s normal way of acting (‘natural law’) and God’s extraordinary way of acting (miraculous primary causation). On Spinoza, see further Dembski, W.A., Intelligent Design: The Bridge Between Science and Theology, Intervarsity Press, Downers Grove, IL, 49–69, 1999. So to be more precise, it is preferable to speak of God’s workings as ‘normative’ or ‘regular’. Return to text. See Stark, R., For the Glory of God, Princeton University Press, Princeton, NJ, ch. 2, 2003; Stark, R., The Victory of Reason, Random House, New York, pp. 12–23, 2005. Return to text. Yet this does not imply a disdain for science, and should be kept in balance with the discussion in ref. 13. Return to text. Bacon’s use of religion in his writings has been a matter of considerable scholarly debate, with some of the most recent scholarship revealing Bacon as a man of sincere personal faith, a faith which runs throughout his most important writings. See McKnight, S.A., The Religious Foundations of Francis Bacon’s Thought, University of Missouri Press, Columbia, MO, 2006. Bacon’s personal faith is, however, peripheral to our concerns here. Return to text. See Hunter, C.G., Science’s Blind Spot, Brazos Press, Grand Rapids, MI, pp. 15–17, 2007; Mortenson, T., The Great Turning Point, Master Books, Green Forest, AR, pp. 21–22, 2004. Return to text. The most famous statement is Bacon, F., The Advancement of Learning, Wright, W.A. (Ed. ), Clarendon Press, Oxford, 1.6.16 (p. 51), 1885. Return to text. See the specific connection of Greek and Scriptural authority in Bacon, F., Novum Organum (1620), reprint, George Routledge and Sons, London, p. 30 (book 1, part lxv), 1893; see also Mortenson, ref. 25, p. 22. Return to text. In like manner, Bacon argued that the attention of science should be turned from the study of purpose in nature (teleology) to the physical questions of how nature works. Both in his approach to Scripture and in his approach to teleology Bacon was anxious to discard metaphysical baggage which he saw as distracting from empirical scientific inquiry. See Bacon’s distinction between ‘physic’ and ‘metaphysic,’ in Advancement of Learning, ref. 26, 2.7.3 (pp. 113–114); and his dismissal of final causes in Novum Organum, ref. 27, pp. 88–89 (book 2, part ii). Yet, just as he did not discard Scripture, neither did Bacon discard metaphysics: see his acknowledgment that teleology is a proper pursuit as long as kept separate from physical scientific inquiry, in Advancement of Learning, ref. 26, 2.7.7 (pp. 118–120); See also Weinberger, J., Introduction to Bacon, F., The Advancement of Learning, Kitchin, G.W. (Ed. ), Paul Dry Books, Philadelphia, PA, pp. xi–xiii, 2001. Return to text. See Hunter, ref. 25, p. 17. Return to text. Garroutte, E.M., The positivist attack; in: Smith, C. (Ed. ), The Secular Revolution, University of California Press, Berkeley, CA, p. 199, 2003. Return to text. In natural theology, as Michael Ruse has noted, ‘One could do one’s science and at the same time claim that, through one’s findings about the marvelous nature and workings of the empirical world, one was burnishing the most powerful argument there is for God’s existence and perfect, all-powerful nature.’ Ruse, M., Darwin and Design: Does Evolution Have a Purpose? Harvard University Press, Cambridge, MA, p. 41, 2003. Return to text. We speak of ‘apparent’ conflicts, because real conflicts between science and Scripture are in fact proscribed by the nature of Scripture as truth. The issue is always one of interpretation, and the issue of authority arises when the observer must choose whether to reinterpret science or reinterpret Scripture. See my introductory essay: Weinberger, L., An antidote to compromise, Creation Matters 9(4):5–7, 2004. Return to text. That is, neutrality at the basis of our theory of knowledge. Return to text. See 2 Corinthians 10:5. Return to text. See Bahnsen, G.L., Always Ready, Covenant Media Foundation, Nacogdoches, TX, pp. 3–9, 1996. Return to text. Though there may be differences of interpretation on any number of issues, that there is a real standard deducible from Scripture is not in doubt by anyone (except a radical literary deconstructionist). Contrary to the propaganda of activist secularizers (see Garoutte, ref. 30, pp. 203–210), very good arguments can be made that Scriptural interpretation is in fact more sure (less subjective) than scientific interpretation: see Bahnsen, G.L., Science, subjectivity, and Scripture, <www.cmfnow.com/articles/pa044.htm>, accessed 20 December 2007. Return to text. See Romans 1:18–25. Return to text. Uniformitarianism being merely the geological equivalent of biological naturalism. See Reed, J.K., Klevberg, P., Bennett, C., Akridge, J., Froede Jr, C.R. and Lott, T., Beyond scientific creationism, CRSQ 41(3):216, 217–228, 2004. Return to text. See generally Larson, E.J., Evolution, Modern Library, New York, pp. 13–93, 2004. Return to text. Darwin positioned himself on the rhetorical high ground here by explicitly presenting his work as Baconian. See the interesting discussion by Gould, S.J., Deconstructing the ‘science wars’ by reconstructing an old mold, Science 287:253–261, 14 January 2000. Return to text. See Garroutte, ref. 30, pp. 200–212. Return to text. As a nineteenth century writer put it, ‘All the followers of science are fully persuaded that the processes of investigation … will give one certain solution to every question to which they can be applied.’ Quoted in Garroutte, ref. 30, p. 212. Return to text. English physicist John Tyndall, a self-proclaimed exponent of the ‘gospel of naturalism’, put it bluntly in 1874, ‘ … all religious theories, schemes, and systems which … reach into [science’s] domain must … submit to the control of science and relinquish all thought of controlling it.’ Quoted in Garroutte, ref 30, p. 212. Return to text. In defining ‘god-of-the-gaps’, O’Collins and Farrugia note that the phrase is ‘used against those who look for God in phenomena that science has not yet been able to explain and forget that God is actively present within all processes of the created world.’ O’Collins and Farrugia, ref. 1 (emphasis added). Return to text. See, for example, Forrest, P., God Without the Supernatural, Cornell University Press, Ithaca, NY, 1996; and see review: Wakoff, M.B., Philosophical Review 107(4):621–623, 1998. Return to text. Weldon, S.P., Book Review: Belief in God in an Age of Science by John Polkinghorne, Isis 92(3):599, 600 (2001). Return to text. Collins, F.S., The Language of God, Free Press, New York, pp. 66–67, 2006. Return to text. See Dembski, ref. 21, 238–245. Return to text. Dembski, ref. 21, pp. 241–242. Return to text. See Dembski, W.A., The Design Revolution, InterVarsity Press, Downers Grove, IL, pp. 116–126, 2004. See also, for a simplified example of a similar argument, Meyer, S.C., ‘Word games’; in: Dembski, W.A. and Kushiner, J.M. (Eds. ), Signs of Intelligence, Brazos Press, Grand Rapids, MI, pp. 116–117, 2001. Return to text. See, for example, the synopsis of arguments in Woodward, T., Darwin Strikes Back, Baker Books, Grand Rapids, MI, pp. 74–77, 2006. Return to text. See generally Dembski, W.A., The Design Inference, Cambridge University Press, Cambridge, 1998. Return to text. See generally Behe, M., Darwin’s Black Box, Free Press, New York, 1996. Return to text. There are, however, good arguments that Darwinism is in fact the only half-decent reasonable naturalistic explanation. See, for instance, Dawkins, R., A Devil’s Chaplain, Houghton Mifflin, New York, pp. 78–90, 2003. With this further argument added, then the law of excluded middle would apply, and we would actually be down to a simple ‘Darwinism or Design’ situation. By including this further argument, a new, valid, positive syllogism is formed: Darwinism is the only alternative to design; Darwinism cannot form X; X was designed. And many Darwinists—including Darwin himself and Dawkins—have used the same syllogism themselves: God wouldn’t have done it that way, so the Darwinian process must have done it. Return to text. See Hunter, C., Darwin’s God, Brazos Press, Grand Rapids, MI, 2001. Return to text. It is important to note that we would hold that ID’s scientific arguments are generally compatible with and supportive of the biblical approach, but is insufficient taken alone and is theologically problematic at the presuppositional and exegetical levels. Return to text. Although insofar as it is not basing its methodology on biblical history, we also do not expect ID to always be looking in the right direction. E.g. it has no notion of the Fall to explain deterioration, defence-attack structures and extinction; and no global Flood to explain most of the fossil record. Return to text. Presentation of evidence in apologetics is entirely consistent with a presuppositional apologetic methodology. The key is that evidence is never presented in a presuppositional vacuum. An epistemologically self-conscious Christian can thus present evidence in apologetics, which is not problematic, while never adopting the false attitude of neutrality, which is problematic. For a careful discussion of these issues, see Bahnsen, G.L., Van Til’s Apologetic, Presbyterian and Reformed, Phillipsburg, NJ, pp. pp. 81 n. 104, 634–655, 1998. It is such purported neutrality that actually raises serious problems for ID (a topic that is beyond the scope of this paper). Return to text. It is, in fact, the only foundation capable of warranting science. On the self-defeating nature of non-biblical thought to science, see Bahnsen, ref. 58, pp. 311–404. See also Plantinga, A., Warrant and Proper Function, Oxford University Press, New York, ch. 12, 1993, on the epistemological problem of evolutionary naturalism in particular.